I’ll get to writing down a recipe I recently tried for the most delicious Oatmeal-Chocolate Chip Cookies I have ever tasted (I’m thinking it’s the cup of BUTTER that makes them so delish) but first I have to share some cute kid things. For those who don’t care… hang tight…. the recipe is coming. There are some who read this who do care about the cute things my kids do and say and since I care, and I’m the author, read quick or skip ahead. Little Miss is totally into dancing. She moves the furniture to the side and spins and hops and does what she calls her “signature move” which involves a skip around the room with swinging arms to the latest fun top 40 kid friendly stuff I can find. Here’s the thing, Little Miss loves to dance but has refused to take one step into a real dance class. At first her excuse was her hatred for tights – now it’s her desire to have no structure in her dancing. As she says, “Mom, the music comes on and I have no decision on how my body moves. It just does its own thing.” Her own thing is a joy to watch. Buddy’s vocabulary is blooming. I LOVE what he calls things. We were decorating our Christmas tree last week. He really liked putting up these little red glass ball ornaments we have and was adamant that no one else should hang even one. “Mom, I’m in charge of the red Christmas dots, OK? I’ll do them all.” DOTS – isn’t that great? The other phrase he came up with that I think should go mainstream is calling snow boarding snow surfing instead. I think that’s just as accurate a description and I will now add that to my repertoire of Buddy phrases. OK, so here’s the recipe for really delicious Oatmeal-Chocolate Chip Cookies. I got this recipe from the back of a package of Gold Medal Unbleached Flour. These cookies are quick to whip up, they are drops so there is no rolling or cutting or slicing, and everyone thought they were yum-o. 1. Oven 350F. Beat brown sugar, butter, vanilla and egg until well blended. Add oats, flour, baking soda and salt (I pre-mixed these before adding); mix well. Stir in chocolate chips. 2. On ungreased cookie sheets, drop dough by rounded tablespoonfuls about 2″ apart. 3. Bake 9-11 minutes until golden brown. Cool slightly then remove to cooling racks. These are moist and chewy and buttery and hard not to keep getting into. Enjoy! As a former teacher I think I have the right to say that teachers love a treat…. especially food! When I worked in a school and the word was put out that there were donuts, or cake, or fruit, or burritos or really anything in the teacher’s lounge you had better get your running shoes on because if you didn’t get there early the gettin’ was gone. At the school my kiddos go to the PTA must have heard the word on teachers liking goodies. The first Friday of each month they put out a spread in the teacher’s lounge to celebrate all the teacher birthday’s for that month. So I do my part – every other month or so I bake. I sometimes just whip up a box of brownies, but more often than not, I use this opportunity to try a new recipe. Last month I tried Chocolate Nut Biscotti. I really like Biscotti – it’s especially fun to dip it in coffee – but I’ve never made it. I found this recipe on the inside wrapper of a bar of Ghirardelli baking chocolate and I thought I’d give it a go. Not only was it pretty easy to make (even though there are MANY steps) it was DELISH. So delish that I sent half to my kid’s school and the other half to work with My Man so I wouldn’t gorge on the chocolatey goodness. There’s coffee and lots of butter in the dough and it’s dipped in chocolate. Seriously worth making. Because the recipe was from a Ghirardelli wrapper, of course it’s going to tell you to use their chocolate, but if you have a favorite brand I’m sure it’ll do too. The recipe makes about 30 biscotti. Be sure after making these that you store them in the fridge. If you keep them at room temperature the chocolate gets all melty (at least it did in my house). Stir in eggs, instant coffee, and vanilla in a small bowl until well blended, set aside. Mix the flour baking powder and salt in a medium bowl, set aside. Gradually add the flour mixture, beating well after each addition. On a lightly floured surface, shape the dough into two logs, each 14″ long, 1 1/2″ wide and 1″ thick. Place the logs 4″ apart on the prepared baking sheet. After cooling, cut each log diagonally into 3/4″ thick slices. Bake for an additional 12 minutes or until slightly dry. 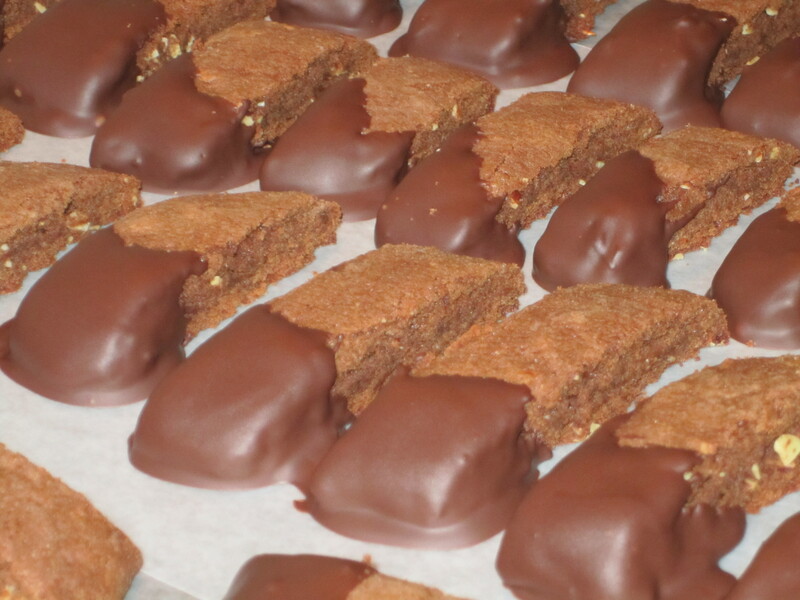 Place the biscotti on a wax paper-lined tray. If you give this a try, let me know – I’m always curious to see if y’all like what I do. If you own a food processor you either use it all the time or lug it out only when a recipe says “in a food processor”. I fall into the second group. I totally wanted one very badly and I got the mother of all food processors as a lovely wedding gift 9 years ago. But, when it comes right down to it, the thing is not my appliance of choice. It is bulky, heavy, and has many parts that need to be washed after using. The only time it is used is when a recipe calls for it… and for this particular recipe I am so glad I own one. These bars are totally delish (could be the tons of butter?) . The best thing about them is that they only take 10 minutes to prepare and they are as pretty to look at as yummy to eat. I cut this recipe out of Real Simple Magazine several years ago and have made them numerous times since. Heat oven to 375F. Butter an 8″ square baking pan. In a food processor, pulse the flour, sugar, and salt to combine. Add the butter and pulse just until the dough comes together. Place dough in a bowl and knead in the oats. Press all but 1/2 cup of the dough into the prepared pan. Spread the jam evenly over the dough, leaving a 1/4″ border around the edges. 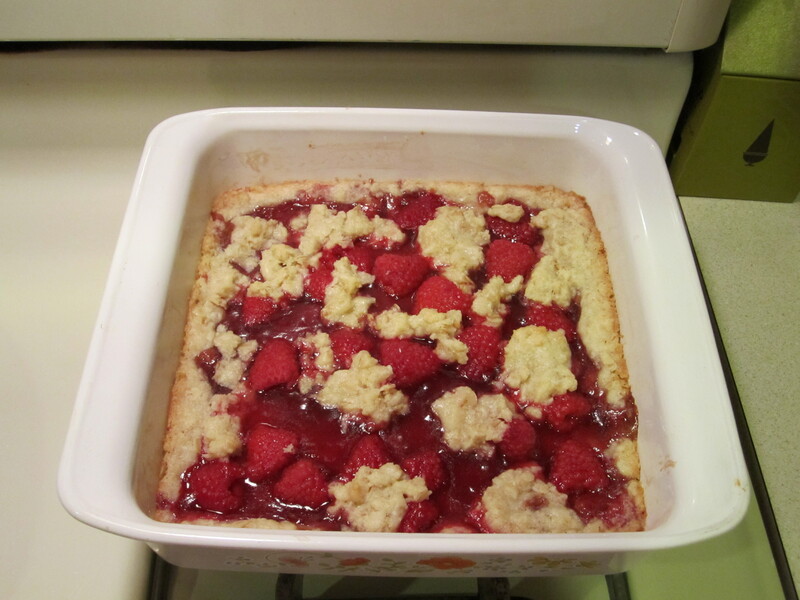 Scatter the raspberries over the jam and sprinkle with the remaining dough. Bake until the edges are golden, 25 to 28 minutes. Let cool at least 10 minutes before slicing. Enjoy a slice of complete delishiousness!